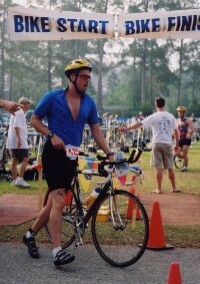 My first triathlon was the White Lake Sprint (750 meter swim, 14 mile bike, 5 kilometer run) race on May 9th, 2004. Below is the race report I posted on TriNewbies, an excellent site for people who are new to triathlons. Avoid a DFL ("Dead Flippin' Last") in the 30-34 Age Group (AG). Go under 1:30:00. I know it is silly to set time goals on your first race, but I'm a numbers geek, and I need to have quantifiable goals. Swim: I've only been practicing "real" swimming for 11 months. I knew I wouldn't be fast in the water, but I knew I could do the distance. My plan was to avoid getting abused in the first minute or two, then find some feet and draft. Like all battle plans, the plan didn't survive the start of the battle. I went out WAY too easy for the first two minutes, and got totally dropped by the pack. Luckily I avoided any bad punches/kicks/etc. and I felt comfortable. My twice-weekly swim class and TI drills helped me do the entire swim efficiently and comfortably, but a bit slower than I hoped. 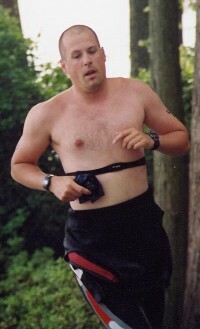 T1: I was a little dizzy after the swim, but managed to do everything in an orderly fashion. I simply took my time and made sure I didn't make any mistakes. The dizziness was gone before I was on the bike. The folks who ran the race don't have the transition times, but my "swim+T1" time was 17:21, 24/48 finishers AG, 119/286 finishers Overall (OA). Bike: The bike course was two laps around a perfectly flat 7 mile course. Jody (my trusty 1987 Cannondale 3.0, upgraded almost everywhere except the wheels) performed admirably, and I was happy when I noticed that the only people who passed me on the bike were people riding nice tri bikes. I know I should be blaming the engine, not the bike... but I feel like rationalizing a bit on this issue :-). I rode just below my LT heart rate the entire way. T2: Nothing to it. Bike on rack. Helmet/glasses off. Hat on. Bike shoes off. Running shoes on. Exit. My "bike+T2" time was 40:23, 24/48 AG, 123/286 OA. Run: I knew this would be my weakest leg, and I wasn't going to worry about getting passed. My practice bricks had all been done from easier bike rides, so my legs felt DEAD coming out of T2. [Editorial note: A "brick", for those who don't know, is a bike ride, followed immediately by a run. It feels weird because your legs have to transition from the perfectly circular motion of cycling to the motion of running. The word stands for Bike...Run...ICK!!!] I knew they would be better in a mile, but this was a race and I didn't have time to wait. I decided to keep my heart at ~LT-5 and tough it out. The run was hot but uneventful. I dumped water on my head at each aid station and managed to stay somewhat cool. Run time was 25:05 (8:05/mile). 31/48 AG, 167/286 OA. Final stats: 1:22:47, 26/48 AG, 136/286 OA. I survived, had much fun, and was happy with my AG performance. I was EXACTLY middle of the pack on the swim and bike, and not too far off the middle on the run. I couldn't have asked for a better first triathlon experience! Next up: An Olympic distance sometime later in the summer.